I bet if I asked you, and anyone else, what’s the one part of an AR 15 that determines the most about your rifle I’d get 100 different answers. But to be honest there is only one answer...The Barrel. The AR 15 is a versatile and dynamic platform. It’s by far the most customizable firearm on the market, but the barrel determines more about your gun that anything else. The barrel can determine obvious things like caliber, but will also involve different legalities, different purposes, weights, lengths and a lot more. When we wrote our AR 15 buyer’s guide we touched the barrels, but this guide is fully dedicated to the barrels. Before we dive into our favorite barrels we want to touch on some quick barrels basics to ensure you understand AR barrels. This will also help you navigate some terms we use throughout the article. We mentioned legalities and I bet your ears perked up. Let’s talk firearms law briefly. The United States is great for gun freedom, but we have some wacky laws, and ways to classify guns. By law a rifle must have a barrel of at least 16 inches. Anything shorter on a firearm designed to be fired from the shoulder makes s short barreled rifle. A Short-Barreled rifle is legal to own in most states, but it does require a tax stamp and what amounts to permission from the federal government. An SBR is an AR 15 equipped with a barrel shorter than 16 inches and a stock. You can also have an AR pistol. An AR pistol can fire a rifle caliber but is legally considered a pistol. To be a pistol it cannot have a stock but can have an arm brace. AR pistols can also have barrels shorter than 16 inches. Every rifles barrel has a dedicated twist rate. The twist rate is how many inches it takes a projectile inside the barrel to make one complete rotation. Twist is often expressed like so, 1:9 and pronounced 1 in 9 inches. Twist rates vary between barrels and different twist rates are designed to function with different bullet and barrel combinations. The projectile weight you plan to use is the best way to choose the appropriate twist rate. 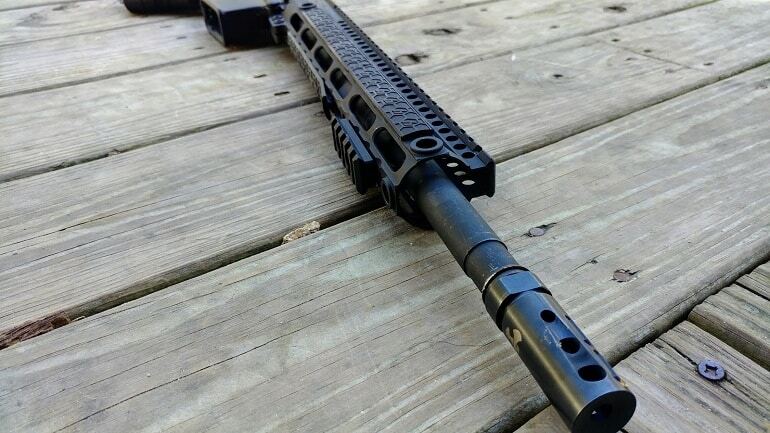 Here is a quick rundown on common AR barrel twist rates and the rounds they pair best with. Barrel testing is done by quality manufacturers to ensure the barrel is well made and up to the task. If your barrel is tested it will be marked and advertised as such. The different testing barrels go through is as follows. HP or HPT - An HP marking designates a High pressure tested barrel. High pressure testing is done with a proof load. A proof load generates over 70,000 psi. 70,000 psi is well above the standard force generated by the 5.56 round. If the barrel can withstand the proof load it won’t have issues with standard 5.56. MP or MPAT - Magnetic particle testing is an in depth inspection that detects subsurface defects. The barrel has a magnetic force put through it, which magnetizes it. Defects are detected through magnetic flux. MP testing ensures the barrel is well put together and is important to do after HP testing. The standard option for an AR 15 will be a 16 or 14.5-inch barrel. 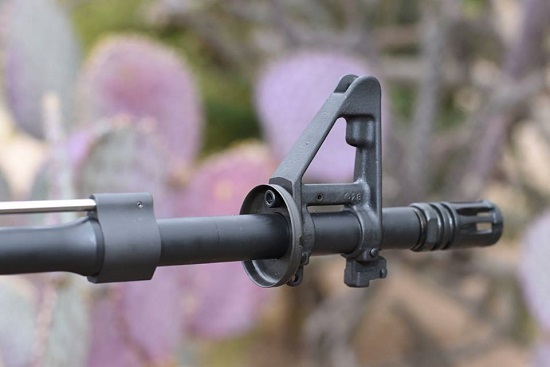 This the most common option and is widely available for pretty much any AR caliber. Contour wise your normal Government or M4 contour is the way to go. This combination will produce an excellent barrel that’s a bit of a compromise on all fronts. It’s lightweight, maneuverable, and long enough to make good use of 5.56 ballistics as well. It’s an adaptable barrel that’s a solid contender for most roles the AR 15 is used for. It’s by far the most versatile barrel options. It’s a solid choice for home defense, hunting, plinking, action shooting sports, and duty use. This is probably one of the most common barrel types in existence. 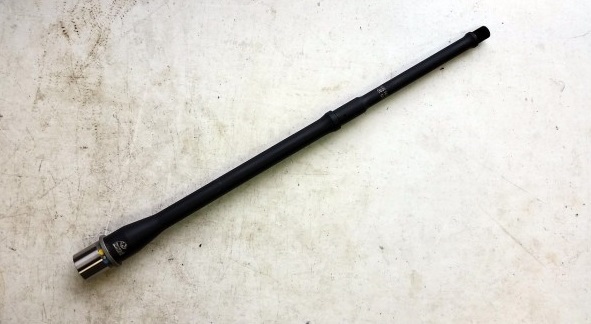 The Socom profile barrel is available in both 14.5 and 16-inch varieties. With the 14.5-inch option be prepared to permanently attach a muzzle device to avoid making an SBR. This is a very basic barrel and is built to mil spec performance. It features a fixed front sight, and a 1:7 barrel twist rate. The barrel is threaded and is made from 415 bar stock steel. It’s a simple, but effective choice that’s proven reliable time after time in the hands of law enforcement, civilians and the United States Military. 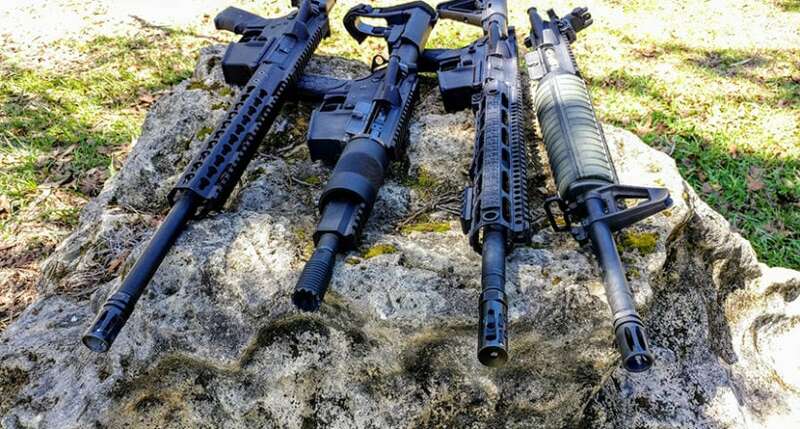 9mm AR 15s and pistol caliber carbines in general have become quite popular. Running off Glock or Colt magazines these little guns are handy, fun, and cheap to shoot. Faxon makes several different barrels for the 9mm, including a 16-inch model designed for a rifle build. 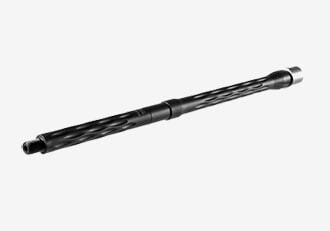 This 16-inch option has a common muzzle thread for muzzle devices, a 1:10 twist rate, and is perfect for a suppressor. These barrels are magnetic particle inspected and are a premium option for any build. Faxon makes good gear, and they make it to last. These barrels have a black nitride coating which gives them a distinct dark black look. If you want to join the pistol caliber carbine craze this barrel is hard to beat. 300 Blackout is the new whiz bang round that everyone is talking about. It’s a fun little cartridge that uses basically everything your standard AR does, but a different barrel. This mini 30 caliber cartridge is a popular round for shooters who want to go suppressed. 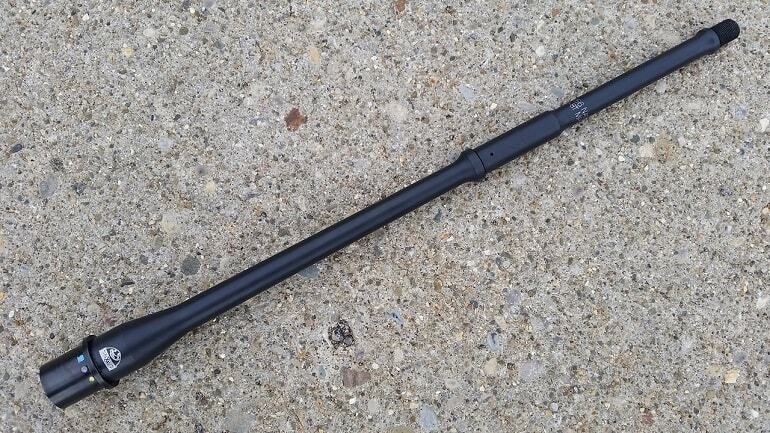 The Brownell’s 16-inch 300 Blackout barrel is a simple and robust option for a standard 300 Blackout build. 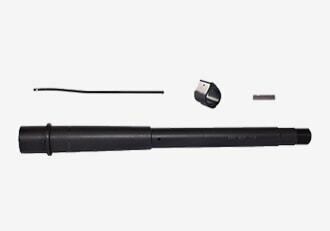 The barrel comes with a low-profile gas block and simple carbine gas system. It’s threaded and ready to accept suppressors and muzzle devices of all kinds. 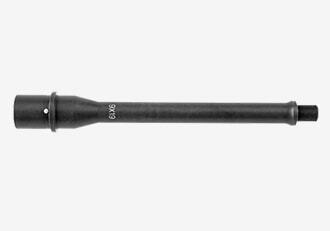 The barrel is fitted with a 1:8 twist rate and is ready for your next build. A short-barreled build can be anywhere from 4 to 14.5 inches. These shorter barrels sacrifice ballistic advantage for maneuverability. It’s much easier to move in and out of a vehicle, or in buildings with a shorter barrel. Short barreled builds could be short barreled rifles, an NFA controlled item, or AR pistol builds. These shorter, lighter guns are perfect for home defense and limited duty use. They are limited in function but excel in their close range niche. You lose a little range, and quite a bit of velocity with a shorter barrel, but in close range situations this isn't an issue. Ballistic Advantage offers two outstanding short barreled options for the 5.56 enthusiast. One is 10.3 inches and the other 7.5. These super short barrels are perfect for AR pistols or short barreled rifles. They use the Hanson profile which is unique and a nice touch. The Hanson profile is essentially a heavy profile barrel so you maintain the harmonic advantage of a bull barrel. 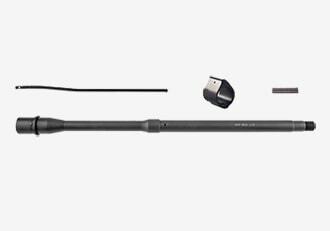 This limits barrel whip and helps you get a little extra range from your short barrel creation. The barrels have a 1:7 twist for use with most common ammunition and heavier ammo will give you a slight ballistic advantage from a short barrel. These barrels are HP and MP tested and inspected. The 300 Blackout was designed as a round to be used in a short-barreled rifle or pistol. 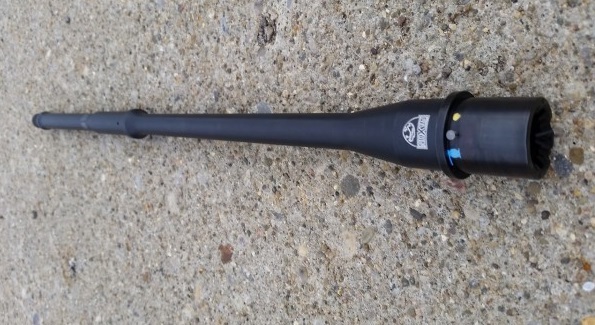 The round reaches its peak potential after only 9 inches of barrel. 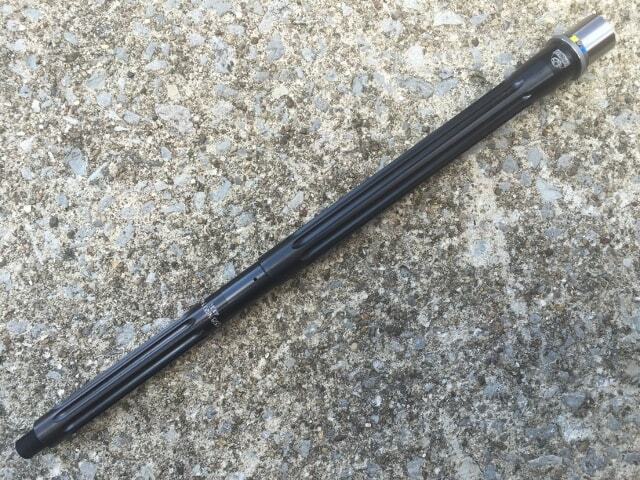 This gives Brownell’s 10.5-inch barrel just a little more than necessary. 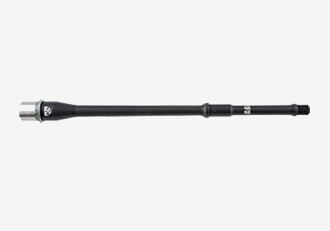 The Brownell’s barrel is from their B-Tac line and made from the always strong and durable 4150V steel. The barrel is threaded, and ready for a suppressor. The gas system is included, and a steel gas block is used for durability and a lifetime of shooting. The B-Tac barrel is a well-made, and affordable option for your next pistol or SBR build. Top it with a can and you have an excellent option for home defense. Since 9mm is a pistol round it's already designed for short barrels. There is no ballistic potential lost from firing it through short barrels. A 9mm AR is an excellent home defense weapon due to its lightweight nature, and short profile. We are going to bring Faxon firearms into the fold for this one. Their Standard 9mm AR 15 barrel comes in both 8.5 inch and 4.5-inch lengths. These super short barrels are made from 4150 steel and use a 1:10 twist for use with all weight 9mm rounds. 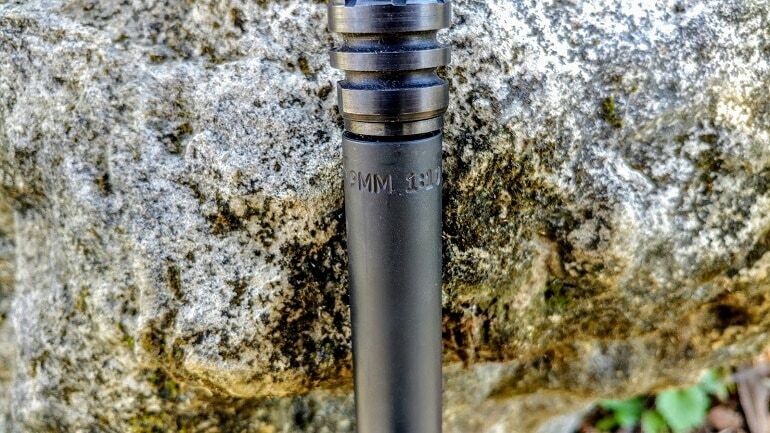 These barrels are threaded specifically for a handgun suppressor. These short barrels are made for blow back guns so now gas system is needed. Lightweight AR builds are all the rage these days. People are trying to get lighter and lighter with every build. A light AR is often a fun gun. It doesn’t necessarily need a dedicated use, but lightweight guns are great for hunting and camping. Lightweight barrels, also known as pencil barrels, are great for activities where you aren't shooting a high volume. They tend to start stringing groups as they heat up after heavy use. Lightweight barrels are quick and easy to point. The lighter nature also makes them easier to carry over longer distances without becoming fatigued. Faxon makes lots of barrels, and you’ll see them a few times in my suggestions. They make quality gear and its made to last. 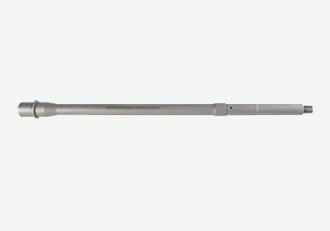 Their pencil thin barrel is designed to capitalize on weight savings, while providing a high-quality barrel. The Faxon Pencil barrels use a narrow O.D. to maximize weight savings, without sacrificing strength and durability. These barrels are made from full auto rate 4150 CMV steel and use a QPC black Nitride finish for corrosion resistance and strength. The barrels come in a variety of lengths including 16.1 inches, 14.5 inches, and even 10.5 for pistols and SBRs. 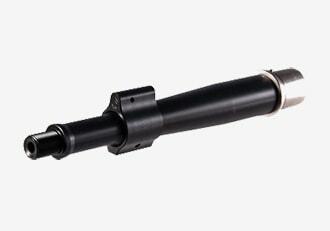 They are threaded and are designed for mid length of carbine length gas systems. If your goal is to hit tiny targets at long ranges there is an AR barrel for that. For long range accuracy you are going to sacrifice maneuverability. You’ll also be gaining the better ballistic advantage when it comes ammunition. This mean a higher velocity, less bullet drop, and ultimately a longer effective range. These barrels are often heavier, occasionally called bull barrels. This added bulk means an added weight. A heavier barrel places more weight to the front of the gun, which can make standing, or unsupported shots, more difficult. 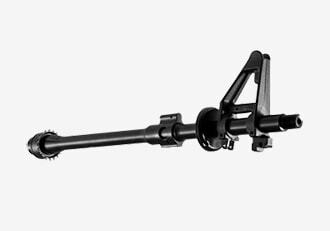 These guns are most often used in tandem with a bipod or a rest. 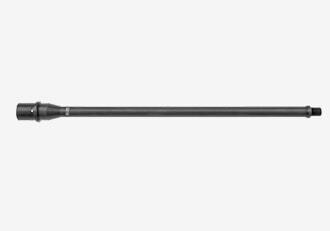 Faxon makes the list again with their always excellent 223 Wylde Flame fluted heavy barrels. The 223 Wylde is a chambering that gives you the superior accuracy of the 223 round, while maintaining the ability to fire 5.56. The Faxon Match Grade barrels are fluted to reduce weight just a bit, and to encourage cooling. 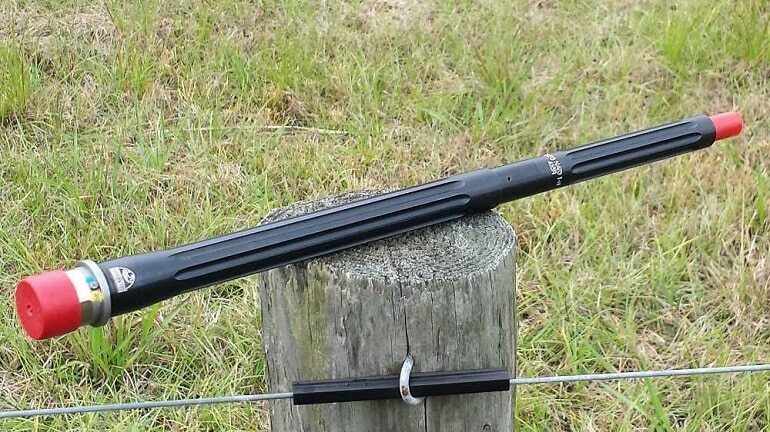 The side effect is an honestly awesome looking barrel designed for long range precision shooting. The barrels come in three lengths, 16 inches, 18 inches, and 20 inches. The barrels have a twist rate of 1:8 and this allows you to stabilize more effective long-range projectiles. These high-end barrels aren’t cheap, but they are a no compromise option when it comes to accuracy and long range lethality. 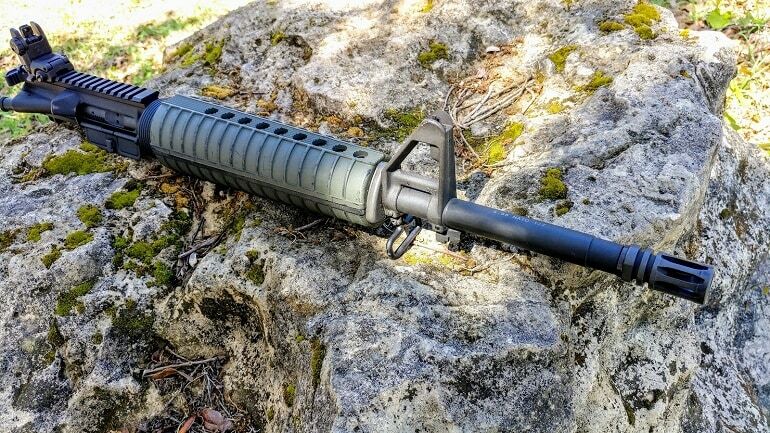 The 224 Valkyrie is the latest in long range shooting for an AR 15 platform. This round is made for 1,000 yard shooting in an AR platform. It’s projectile remains supersonic beyond a 1,000 yards. This is starting to become the go to Gucci round for long range shooting. Brownells caught on fast and began producing 224 Valkyrie barrels. This stainless steel model improves even more on the accuracy of the round. Your options for length are 18 to 24 inches. This is a medium contour design so it’s not so front heavy as well. 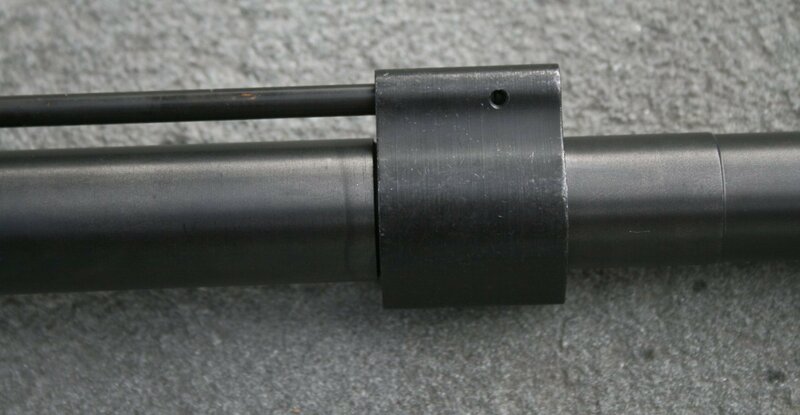 The barrels use a rifle length gas system and threaded for muzzle devices. With the right barrel you can really reach out and touch a target with extreme precision. A Dissipator barrel is a 16-inch barrel with a front sight placed a much closer to the end of the barrel. There are several advantages to this system. The modern Dissipator allows for a longer sight radius, and a longer handguard. They look odd, but a rifle equipped with a Dissipator barrel gives more room for attaching accessories and for gripping the rifle. Some Dissipators have a rifle length gas system, but due to the reduced dwell time the gas ports must be opened up significantly. The biggest disadvantage to a Dissipator barrel and upper receiver build is weight. They can be a little beefy with the longer handguard, A2 front sight, and low-profile gas block. Okay I know Faxon again, but I can’t help the fact they make amazing products. 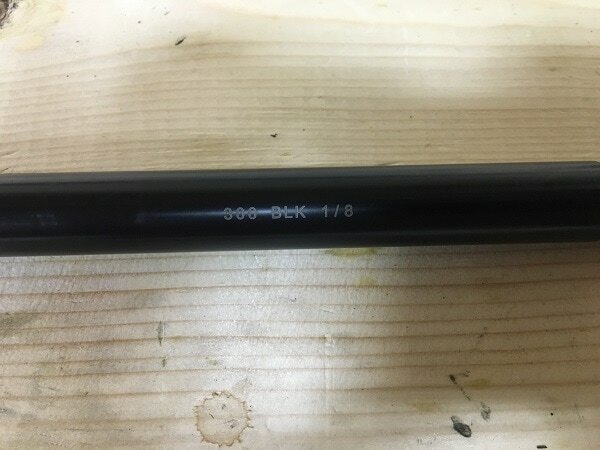 I’ve never been disappointed with a Faxon barrel for ARs, Glocks, and more. 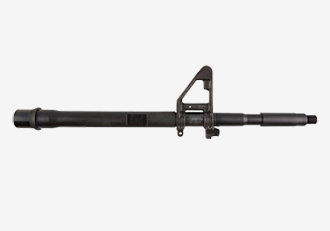 This modern Dissipator is a 16 inch barrel with a A frame front sight, and a hidden low profile gas block. The barrel is threaded, and made from 4150 steel. This system allows you to use full length rifle rails, my personal favorite being Magpul’s offering. The Faxon barrel is a great choice for your oddball Dissipator build. Welcome to the barrel life. If you thought it was simple I’m sorry to break your heart. There is always the simple option, but if you’re like me when you are presented with just so many choices things get confusing and hard. That’s the joy of guns and capitalism though. Until next time folks, stay safe, train hard, and get educated. Nice article. Would have bin a little better if the pintrist logo didn’t appear over each barrel. Bill, on your request we have made the site-wide change and moved the social logos to the bottom left of each photo. Now you will not have the issue in seeing the photo.